I’ve always wanted to visit Greece, but until I can make that magical trip, I’m happily making do with this delicious and easy to make Sheet Pan Greek Chicken. I shared my recipe for Sheet Pan Moroccan Chicken earlier this year, so you know that dinner can be ready in a little more than 30 minutes. 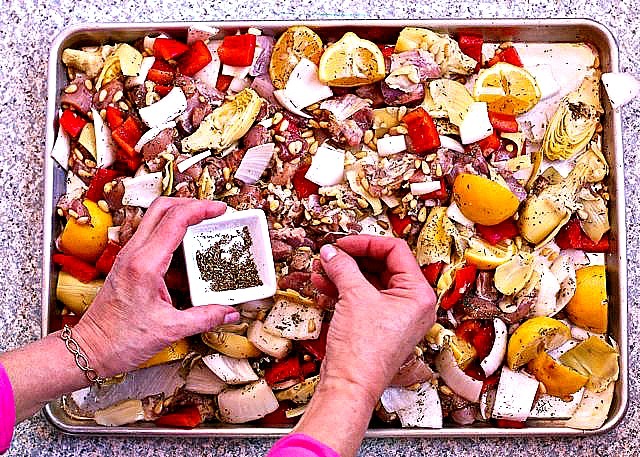 Sheet Pan Dinners are especially wonderful because everything is blended together in one pan, so cleanup is a quick and easy. 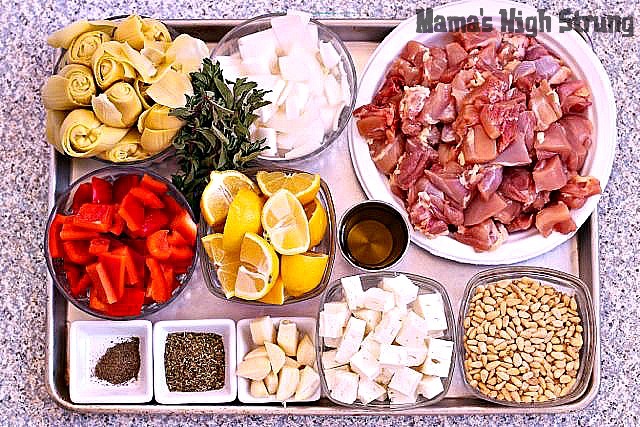 This Sheet Pan Greek Chicken is loaded with the flavors of the Mediterranean, like oregano, lemons, artichokes and pine nuts. The red bell pepper adds color and crunch and the feta adds a subtle tangy saltiness. You can print the gluten-free recipe… and scroll down for the tutorial. I threw in some pitted Kalamata olives because they’ve got an interesting (but mild!) umami taste… but you can always leave them out. 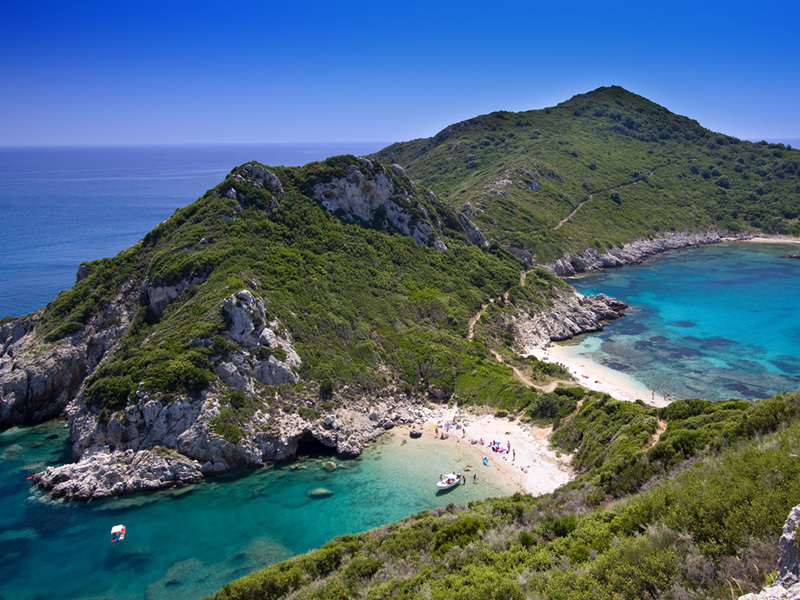 If you can’t actually get to Greece…this dish will carry you there. It’s the next best thing to being in Santorini… (well, kinda!). Move oven rack to center. Heat oven to 425°F. 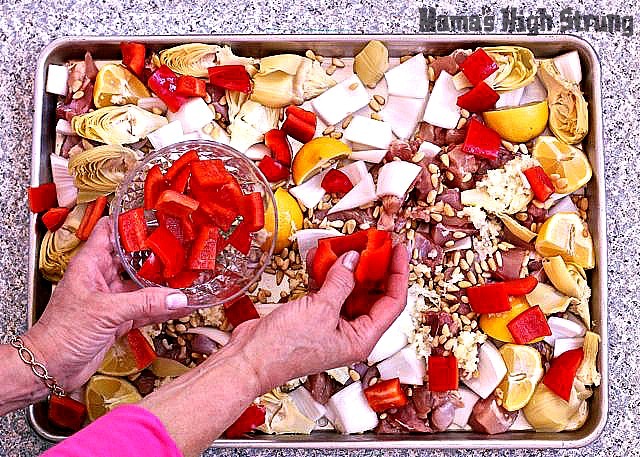 Place chicken, drained artichoke hearts, onion, red pepper, lemons, pine nuts (if using) and garlic on a large, rimmed sheet pan or baking sheet. Drizzle olive oil over meat and vegetables. Sprinkle with oregano and black pepper. Toss gently with a spatula to combine. Add Kalamata olives (if using). Roast for 20 minutes, stir and add the feta cheese. Roast for another 5 to 10 minutes or until chicken is cooked through. Remove from oven and garnish with fresh oregano or mint leaves if desired. 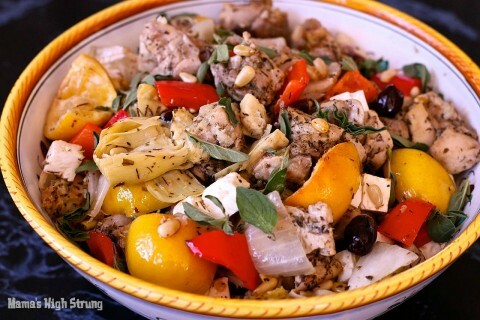 1. you’ll need… 1½ pounds boneless skinless chicken thighs; 1 can (14 ounces) artichoke hearts (can be halved or quartered), drained; 1 cup chopped onion; 1 cup diced red pepper; 2 lemons cut in quarters or slices; ¼ cup pine nuts (optional); 4 cloves garlic minced; 2 tablespoons olive oil; 2 tablespoons dried oregano; 1 teaspoon ground black pepper; ½ cup Kalamata olives (optional); 8 ounces feta cheese; ½ cup fresh oregano or mint leaves (optional); salt to taste. 2. Move oven rack to center. Heat oven to 425°F. 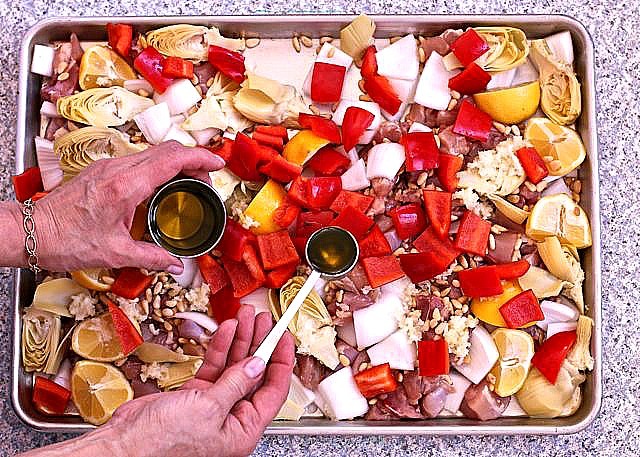 Place chicken, drained artichoke hearts, onion, red pepper, lemons, pine nuts (if using) and garlic on a large, rimmed sheet pan or baking sheet. 3. Drizzle olive oil over meat and vegetables. 4. Sprinkle with oregano and black pepper. Toss gently with a spatula to combine. Add Kalamata olives (if using). 5. Roast for 20 minutes, stir and add the feta cheese. Roast for another 5 to 10 minutes or until chicken is cooked through. Remove from oven and garnish with fresh oregano or mint leaves if desired. 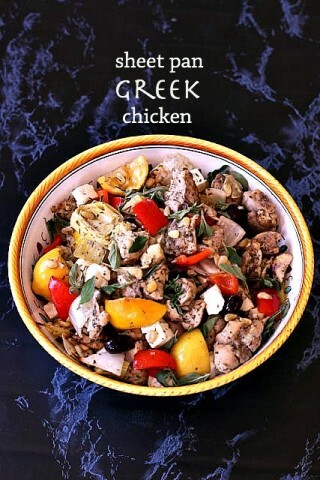 This looks so beautiful and delicious; I could almost small the oregano which is becoming one of my favorite spices. Annette, you are so sweet! I’ve used dried oregano and fresh oregano and even thyme and rosemary when I didn’t have oregano… it’s all about creating and working with what you have on hand! This recipe looks delish and it’s so healthy too! Thanks, Sandy! I like that you can add whatever you have on hand. Thanks for stoping by! Awesome recipe!! 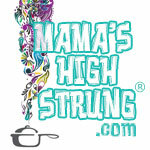 How do you sign up for your newsletter?? This looks really yummy and easy to make too! I prefer chicken thighs definitely, much moister and tastier. I have pinned so can try this recipe out. Great recipe! I love Greek food. Thanks for sharing at Bloggers Brags Pinterest Party! Thank you for an easy step by step recipe. I love roasting veggies so am really excited to make this recipe! I love that you use chicken thighs in this recipe. Not only does it look delicious, it’s also inexpensive to make! Yes Michelle… chicken thighs don’t get dry like chicken breasts. Thanks for saying hi! Thanks Akamatra… please let me know what you think (you are the expert, here!). Chris, this looks delicious! Think I’ll prepare it tonight! Let me know what you think Peggy!